Most if not all basketball fans recognize John Wooden as the legendary coach of the UCLA Bruins who lead them to 10 NCAA championships and revolutionized the game of basketball. But many do not know he was also a great player in his day. He never played in the NBA and his position on this list is mostly symbolic because of the impact he has had on the game. Wooden went to Purdue university where he earned all Big 10 honors and lead the boiler makers to the 1932 NCAA title. The title was done by a vote not a tournament as the tournament did not begin until 1939. In his senior year he averaged an unheard of 12 points a game. This was at a time when many basketball games ended with scores in the 20s. He also scored a than NCAA record 21 points against the University of Chicago. After graduating in 1932 he joined the Indiana Kautsky’s of the National Basketball League. He became an immediate star with the Kautskys and lead them to the 1932 NBL championship game. Wooden scored 21 of his teams 31 points and they lost by one to the Akron Firestone Nonskids. During his rookie year Wooden made 134 straight free throws which is still an American professional basketball record. The NBL ceased operations after one year, though it would be picked up again a few years later with many of the same teams, so Wooden and the Kautskys became an independent barnstorming team. Records from these days are nearly non existent but one eye witness account claims that Wooden put up an astonishing 40 points in a game against a team from Detroit. In 1935 the Kautskys joined the Midwest Basketball Conference, which became the NBL after several teams from the original NBL merged. In 35-36 Wooden was amongst the best players in the newly formed MBC. Wooden played with the Kautskys until 1937 when he joined the Whiting Ciesar All-Americans. The All-American’s finished with the second best record in the Western Division at 12-3 with Wooden averaging just under 11 points per game. 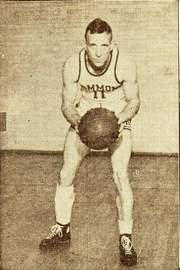 Wooden would split time between the All-American’s and Kautskys in 1938-39 averaging 7 points a game. He retired following the season. He would of course go on to become the greatest coach of all-time in college basketball and one of the most believed basketball personalities of all-time. He died in June of 2010 at 99 years old. Year Team Games total points avg.